It already has been thirteen years since 9-11. If you would have told me in 2001 that thirteen years later the terrorists would have their own caliphate (Islamic country) and the threat of terrorism would have been more dangerous now than in 2001, I would have say that sound like a failure. After all these wars and interventions it’s hard to argue that the world is a safer place today. The failure is also very insulting to our soldiers who lost their life in fighting the cause. Now I’m arguing that the recent course of action to use more military force to intervene against ISIS is not going to help the situation. If we keep doing what we have been doing for the last thirteen years, how can we expect different results? 2) The people rallied behind President Bush even if you didn’t like the guy. At the time a lot of people didn’t recognize Bush as the real President because of the highly disputed 2000 elections against Al Gore. (The presidential election was so close that it took five weeks to determine the winner.) The attacks stopped that “Bush didn’t really win” debate and America needed a leader to look up too. That leader happened to be George W. Bush. 3) The world united behind the U.S.A. “You’re either with us, or against us” which translates into “You are bombing with us, or you will be bombed”. More than a decade after the cold war, U.S. influence around the world was slightly drifting away. For a long time the cold war divided the world in two. At the time you were either behind the U.S. or with the U.S.S.R. The cold war was branded as sort of a good vs evil battle. 9-11 happened and the battle to defeat evil was back on. The above resulted in the official invasion of two countries and multiple interventions (drone attacks, clandestine special operations) in a lot of different places around the world to “erase” terrorism off the planet to make the world a safer place. Individual liberties and rights also took a back sit in the fight to make a better world. I mean who wouldn’t want a safer world? Let’s kill all the terrorists because they are evil and we are good. Sounds simple enough and who in their right state of mind wouldn’t support such a simple concept. And here we are thirteen years later, back to square one. In the Western world, the traditional image of a terrorist was portrayed as someone living in a cave and to communicate with the outside world they would send a guy on a camel. Anyways that’s what we thought. It looks like they have evolved pretty fast. In the thirteen years of fighting terrorist a more extreme, more sophisticated, and more powerful group as emerged. ISIS, the evil child of the evil Al-Qaeda, is an upgraded version on steroids. If Al-Qaeda wanted attention, they would make a grainy tape to Al-Jazeera with the hope they might get broadcast. ISIS bypass the middleman and is all over YouTube, is trending on Twitter, and five-star jihad is viral a thing. Forget riding camels; they now are “rolling” in U.S. made Hummers and tanks. This is not some small ragtag group of people running around with AK-47s. This is a full-blown army with sophisticated weapon. They are also doing very financially. According to U.S. intelligence, they have become a self-sustaining financial juggernaut, earning more than $3 million a day from oil smuggling, human trafficking, and theft and extortion. 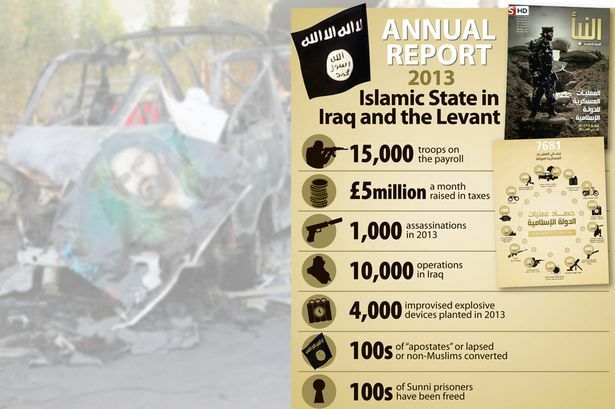 Like a corporation that needs to report to its shareholders, ISIS has their own glossy annual report with “investment highlights” such as the number of bombings, assassinations, checkpoints, suicide missions, cities taken over. That way they can show results to the people who contributed to their cause. You can also buy ISIS apparels to support their cause. ISIS is also recruiting directly in Western countries’ backyard. A lot of the jihadists have Western passports (U.S., Canada, France, Denmark, U.K., etc…) and speak multiple languages. We now have jhttps://news.vice.com/article/danish-police-are-trying-to-rehabilitate-jihadists-returning-from-syria from Syria with post-traumatic stress disorder from their tour of duty in the “Islamic State”. Like Al-Qaeda, ISIS fuels on being attacked. When ISIS is beheading people, they are directly asking to be attacked. This is what they want. This is also what Osama Bin Laden wanted. Bin Laden consistently dwelt on the need for violent jihad to right what he believed were injustices against Muslims perpetrated by the U.S. Osama Bin Laden knew he couldn’t go and fight the Americans in their country. But if he manages to provoke them and bring them to the Middle East and to their Muslim worlds, where he can find them or fight them on his own turf, he would actually teach them a lesson. Invading Iraq and Syria is ISIS’s wish. The coalitions will lose personnel, money, patience and their reputation will take a toll. We have seen this story repeat itself over and over (Remember Vietnam?). There’s often writing from military personal on a cruise missile. When somebody is asking you to hit them first, it’s usually a trap that serves their benefits. You should approach the situation with skeptic eyes. You must ask why would anyone on Earth wish for a rain of Hellfire missiles upon them? Because it serves their purpose. When you are killing Muslims and innocent people, it fuels their recruiting and validates their purpose. It also helps implementing their Islamic agenda. 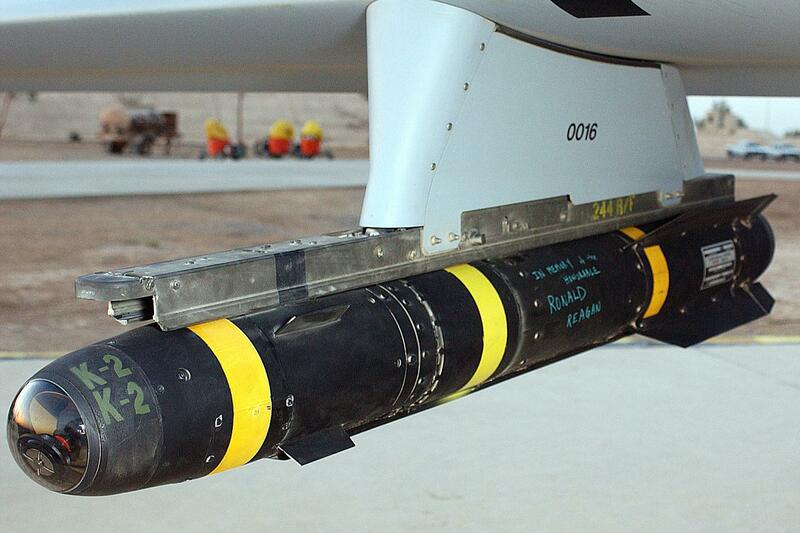 As precise and accurate as the Hellfire missiles are, the unfortunate true is that innocent people will die. Schools, homes, mosques, and hospitals will be hit and innocent people will die. There will be dead children and women in the process. Innocent people getting blown away by missiles do not extinguish the flame burning inside terrorisms. Thousands of people are fighting alongside jihadists in Syria for a reason that is 1,400 years old: The Prophet Muhammad demands it. They are fulfilling their religious duties. As I mentioned above, I don’t believe that direct military action is the smartest approach to the ISIS problem. We have tried that for the last thirteen years and we only made the enemy stronger. Now that ISIS wants “us” to attack them, we are falling for a trap. I’m also not suggesting to do nothing and to let ISIS commit genocide and kill innocent people. I am suggesting a different approach to dealing with the ISIS threat. Let’s use a smarter more strategic approach. Let’s beat them at their own game. If you don’t attack them, you are not contributing to expanding their cause. The Islamic State is like a big fire right now that you can’t put out with missiles. As I have explained, attacking them is like throwing fuel directly on it. What you want to do is to let that fire die on its own. My idea is to let them self-destruct. Encircle the Islamic State, contain them, make sure that ISIS does not gain more territory. It would be even more of a chaotic mess if ISIS spills in Jordan or Lebanon. The coalition should protect the minorities, block the flow of goods, work for the good of the local population and watch them deteriorate. ISIS will implode if it keeps operating like they are now. Let them run their own country and see how successful they are. Let’s see how good they are at managing social programs, government spending, raising taxes, taking care of the sick and the weak. What will happen is that they will split into factions and fight each other. One of the things that drive me absolutely bunker is that nobody is asking why do they hate us? Why did they attack us on 9-11 if we are so good? The only answer we have is the one President George W. Bush gave after the attacks; they hate us for our freedom. If you try to seek another answer you get branded as an Anti-American and supporter of terrorism. Maybe if we knew the answer and the roots of the problem, we could prevent another catastrophe. It’s insulting to think that’s the real answer. I’m sure there’s the odd one with a different opinion that doesn’t like “freedom”, but that’s not something to blow yourself up over. What have we done to have terrorists fly planes in towers? That seriously needs to be answered. If you find the answer, maybe you will find the solution to preventing more attacks. Are you sure it not a consequence of American foreign policy? Are you sure it has nothing to do with supporting brutal corrupt regimes in order to serve your own interest? Maybe it has something to do with consistently opposing democracy and independent development in certain part of the world. Maybe it has to do with unilateral supporting Israel’s military occupation of Palestine. These are not the kind of answers you find in most of the big media and the press. Another part of the solution is to repair America’s image abroad and at home. Instead of flexing their military muscles and being arrogant, the U.S. should focus going back to what made the world like America in the first place. Saying “I am American” used to be a cool thing in the 70’s and 80’s. That obviously changed because today Americans need a Canadian flag patch on their luggage when they travel. America was the model for spreading democracy, freedom, and for pushing individuals to pursue their dreams. Underneath all the problems and garbage, that America still exists but needs some polishing. The U.S.’s greatest feature is its own people. It’s shocking on how the different the American government and its people are. No wonder they are not satisfied with their elected representatives. They have nothing in common. The U.S. government and its foreign policies certainly do not represent your American citizen. American people are some of the nicest and most generous people in the world. Instead of “policing the world”, the U.S. should become the role model it that use its strengths to make the world a better place. Still possible, it will take a lot of time to change the anti-American feelings around the world, but if America goes back to the fabric that made America great, it will work. 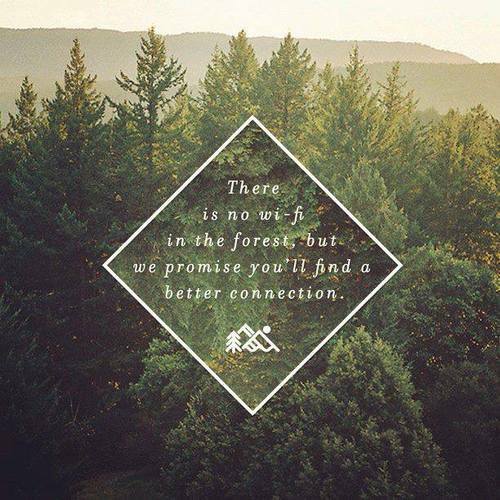 No WIFI in the forest but…..